Browse our Red Panda Beads original patterns to spark inspiration and take your beads design to the next level. By offering an assortment of original handcrafted jewelry ideas, we aim to help you craft beautiful beading with our elegant patterns. Download a free digital pattern for your handmade jewellery endeavors. Take our patterns and projects stitch by stitch or use them as a reference to create your own beaded bracelets and beaded necklaces. Make sure to sign into your Red Panda Beads account before checking out to be eligible to receive a free downloadable pattern, and become your own jewellery maker today! In order to download the electronic files you must first register as a Red Panda Beads customer BEFORE checking out. The download files are housed in your Red Panda Beads account and you will need to log on to your account to download the files. NOTE - The instructions call for a 14mm wooden or acrylic bead to be inserted within the beaded bead - these are very difficult to find and unable to source them, we've omitted them from our beaded beads for this design. 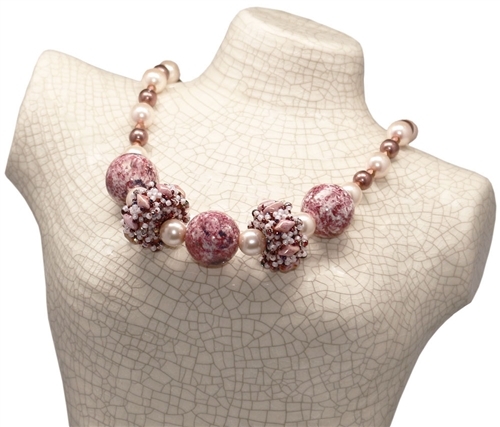 Adjust the length of the necklace by adding more beads.